With the Busworld exhibition at Kortrijk in Belgium in October fast approaching, MAN staged its preview last week in the Polish capital, Warsaw. 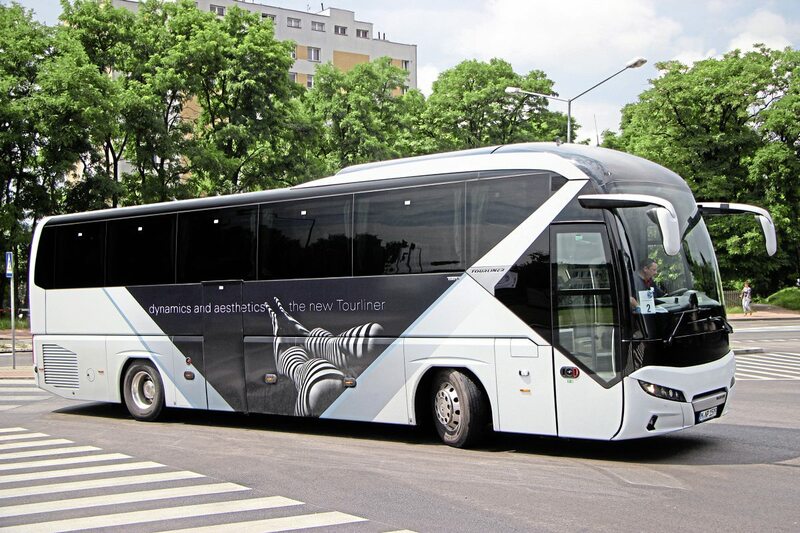 In a packed programme, the press also took the opportunity to include a visit to their bus production facility at Starachowice and a ride & drive experience in a fleet of Neoplan Tourliners. 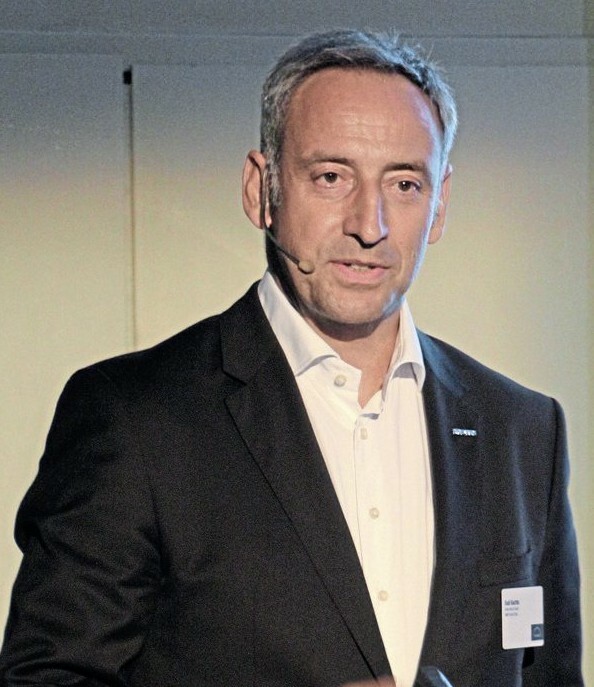 The event started on a sombre note with a minute’s silence for the passengers who died and were injured in the previous week’s coach crash in Bavaria, but moved upbeat as Rudi Kuchta, Head of Sales & Product, Bus & Coach for MAN told how the business was developing. Sales in 2016 had increased from 5,025 in 2014 and 6,105 in 2015 to 6126 units over eight tonnes. Made up of 1,553 city buses, 532 intercity buses, 1,250 coaches and 2,791 chassis, this figure included 3,648 units sold in Western Europe, of which 1,351 were to the German market. 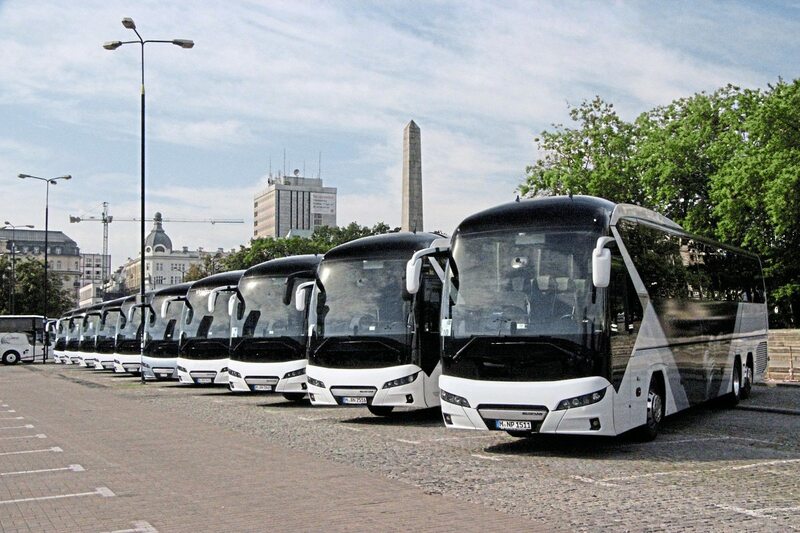 Neoplan-branded vehicles accounted for around 1,000 of those. Total deliveries for this year to the end of June total 2,622 but adding in the outstanding order intake for 2017 build at 3,608 units already exceeds the total of deliveries in 2016 with the projected total for 2017 standing at around 6,500. Not everything was yet as they wanted it to be but sales were growing and there was a plan for the future that projected a rise to 8,020 units by 2021. 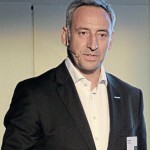 After running through sales in regions and key markets, Rudi Kuchta explained that the strategic pillars of the bus programme were: international key accounts, body builder management, tender management, new buses, the aftersales operation and support network, training, used buses, product launches and order processing. 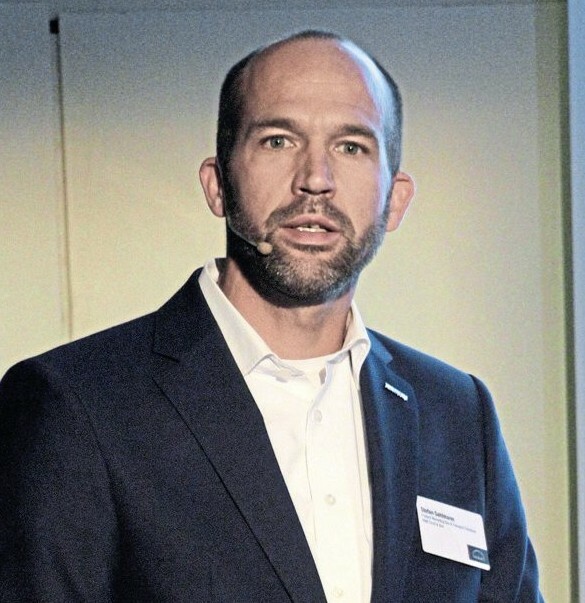 MAN’s Product Marketing Manager, Jan Aichinger, who UK operators will recall from his spell as MD of the EvoBus operation in Coventry, then revealed a number of new developments and plans for the future. Among these was a new design of electric-hydraulically driven door for buses that saves 15kg in weight per entrance, runs softly, takes up less space, stays close to the body side, enables each leaf to be opened singly, has less moving parts, needs less maintenance and can be integrated to work in conjunction with an electric wheelchair ramp. 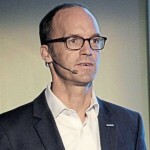 Restating the company’s position on the road to zero emissions, he said it would offer a full range of 12m and 18m battery-electric vehicles (BEVs), the first demonstration vehicles going on test in the fourth quarter of 2018 with partners in Hamburg, Munich, Wolfsburg and Luxembourg. Production vehicles would start to come off the line late in 2019 and would become the third option in propulsion systems along with diesel and gas, with hybrid seen as a clear bridge to electromobility. MAN’s approach would be to offer a modular system applicable to bus and truck that could be tailored to meet operators’ needs in respect of capacity, range, heating/cooling system and charging strategy, although on the latter point, after discussion with operators, it had been decided to prioritise overnight charging over opportunity charging: “We see the future clearly as overnight and both the 12m and 18m will be developed solely for overnight charging,” said Jan.
To help operators with electromobility-related issues such as those relating to energy, operation, vehicle choice and fleet mix, a new operation called MAN Transport Solutions had been set up under Stefan Sahlmann to give customer specific consultancy advice. Initial research with partners in cities suggested that 55% of existing routes were suitable for conversion to overnight charging operation as they were, a further 25% could be operated if there was off-peak depot charging with changes, and 10% would need adaptation of the existing route to be suitable for electric operation because they were beyond the current range capacity. 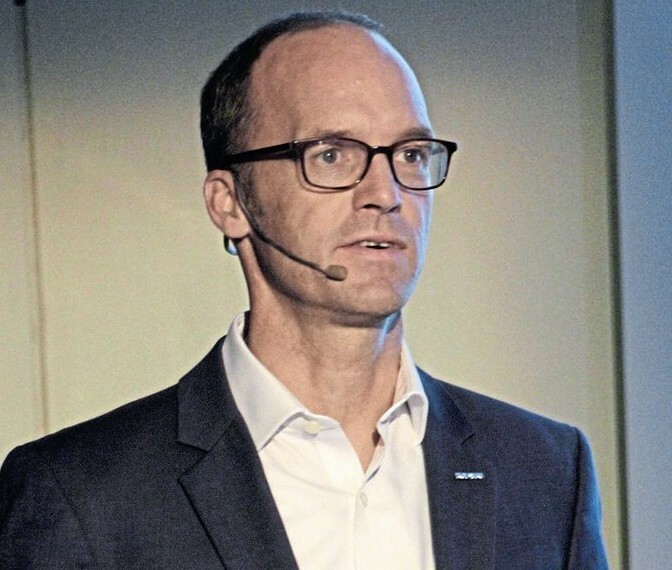 Looking at a graph of the likely peak recharging demand, Stefan said that operators would need to minimise their peak load requirements in order to reduce their peak demand infrastructure costs. MAN’s big launch on the coach front is the new generation of the Lion’s Coach range, which will make its debut at Busworld. Since the range-topping Lion’s Star was discontinued before Euro5 in 2009, the Lion’s Coach has been the MAN brand’s sole integral coach offering. It was explained that the impetus for the introduction of the new model at this time came with the impending requirement to satisfy ECE R66.02, the more stringent rollover regulations, with effect from the end of October this year. This will see the end of several group products including the long serving Lion’s Regio interurban bus and (after a run of only a few years) the Neoplan Jetliner. New and continuing models have stronger structures achieved through the use of higher grade steels with no gain in weight and only minimal internal changes. 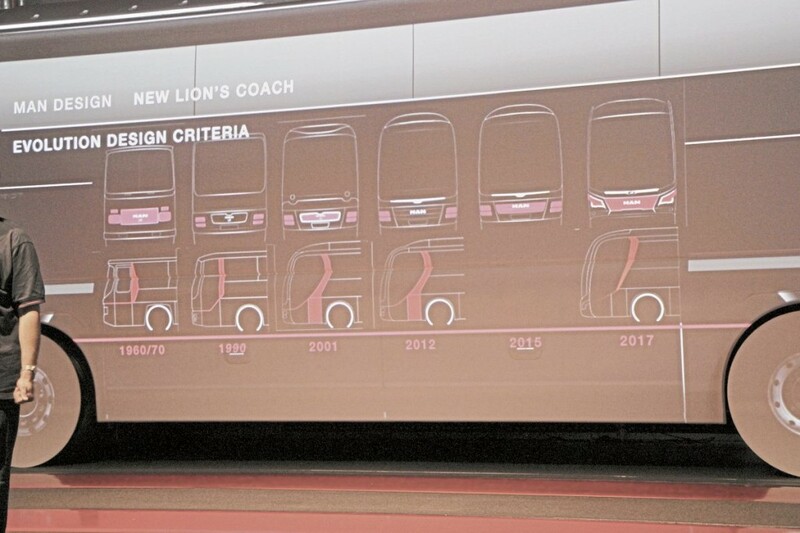 Incorporating the ‘smart edge’ design that is to be a feature of new products from the group, the Lion’s Coach has a completely new yet clearly MAN look that is intended to project efficiency and power. A useful 20% more aerodynamic than the previous model, the main design emphasis has been on separating the driver’s compartment, passengers, luggage compartment and the drive unit areas of the vehicle. A variety of new materials and manufacturing processes have been employed in its manufacture. It is being offered in four different length variants with 12.101m and 13.091m two-axle versions and 13.361m and 13.901m options on three axles. All are 2.55m wide and 3,870m high. Confusingly, both the two-axle 13.091m and the 13.361m tri-axle are marketed as the Lion’s Coach C, while the shorter two-axle is just the Lion’s Coach and the 13.901m is the Lion’s Coach L. Wheelbases are 6.06m, 7.05m, 6.06m/1.47m and 6.6m/1.47m respectively. Luggage space in cubic metres is 11.7, 14.3, 11.8 and 13.2 although I believe this may include internal racks. To German three-star specification without toilet, the passenger capacities are 53, 57, 59 and 63. All versions are powered by 12.419-litre D2676 LOH six-cylinder common rail diesel units mounted vertically at the rear. On two-axle coaches the options are either 420hp/309kW with maximum torque of 2,100Nm or 460hp/338kW with peak torque of 2,300Nm. Tri-axle Lion’s Coach options are either the 460hp unit or a more powerful 500hp/368kW alternative that gives you 2,500Nm. In each case, the engine output is 20hp more than previously and the rear axle ratio has been extended to 2.73:1. All versions have as standard the MAN TipMatic transmission derived from the ZF AS Tronic, embodying a new strategy for pulling away and shifting. All but the 500hp can have the ZF EcoLife six-speed automatic as an option. There was talk of a change from the TipMatic to a Volkswagen group derived transmission, but any change before the introduction of Euro 6D was ruled out. Service intervals have been extended to 140,000km and depending on application, diesel particulate filters should be good for 850,000km or more. Inside there is a new LED strip light illuminating the floor, the racks have been extended further forward and have new closures, there are new integrated service sets and USB points are fitted on every seat. For the driver, there is more storage space, a new heated side window and more clearly laid out switches. Somewhat to the amusement of some European journalists, my predictable enquiries about a right-hand drive version of the Lion’s City were met with the anticipated negative response. Undaunted, I asked about chassis and was told that the new colour dash display would come to coach chassis around the middle of 2018 but otherwise no big developments were planned. The drive trains had been developed for Euro 6C so it would likely be Euro 6D before the next changes. Separate conversations revealed that although there are no current plans to do so, it would be feasible to develop the A95 12m tri-axle double decker that is already sold in Singapore, Hong Kong, Malaysia and New Zealand for the UK. If MAN did decide to go down this route it would need an alliance with a UK bodybuilder and no talks on the subject have taken place.This chassis, originally developed from the A22 single decker, has already been developed in right-hand drive for Euro 6, though the first deliveries have not yet been made. 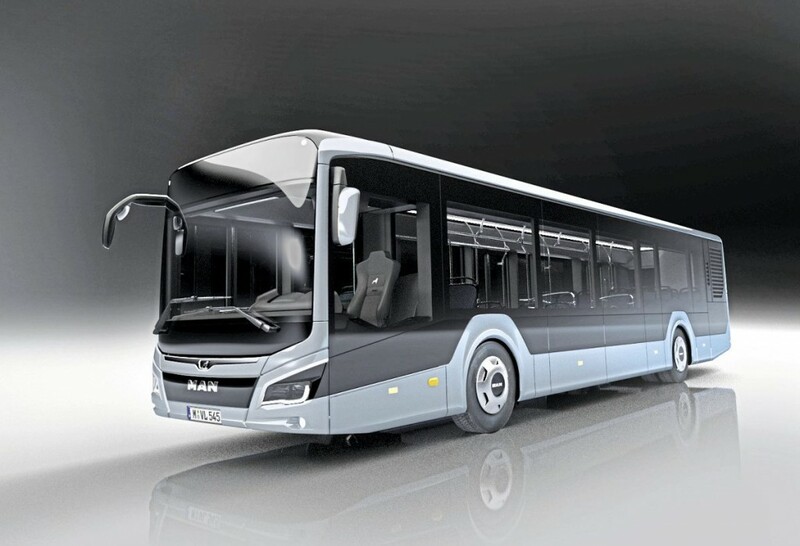 As MAN’s electric system will be available in all chassis, the possibility of an electric A95 was not ruled out and a CNG version could technically also be offered. At present the only MAN buses on order for the UK are 16 destined for the Runcorn Busway operation where similar buses are already operating with Arriva. Despite the many new developments, the fact remains that it will only be the Neoplan Tourliner range that is offered to the UK coach market in integral form, though chassis mounted products will add to the available options. From the Neoplan range, the Starliner is gone, there are no plans for right-hand drive versions of the Cityliner or double-deck Skyliner; similarly there is no intention to offer the new Lion’s Coach. The good news for loyal Neoplan customers is that there is a new Tourliner model, the Tourliner C, or P10 if you like MAN’s confusing in house model designations. This additional model follows the well-trodden path to offering a longer option on two axles. Slightly shorter than the existing 13.4m long P20 tri-axle, Tourliner C is 13.1m long and will be available in right-hand drive with up to 57 seats. There will be a left-hand drive option with a reduced height toilet compartment with a double seat on top taking the total capacity to 59 but there are no current plans to offer this in the UK. Production of the Tourliner C begins on 1 October and the right-hand drive and low toilet models will follow at the beginning of 2018. The design has been developed to take advantage of the 19.5tonnes GVW limit that will be standard in Europe and, although the UK has not yet adopted this, the concept still works, albeit with less leeway on luggage-carrying capability. 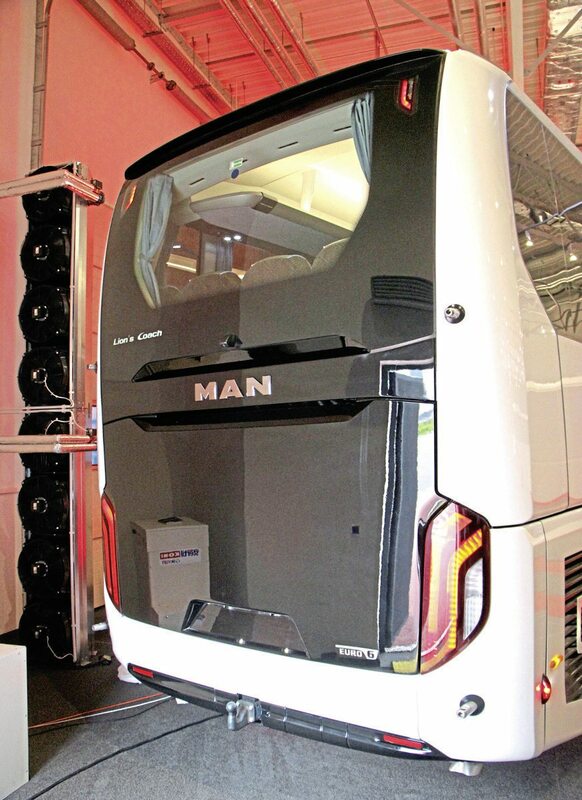 MAN quote a luggage capacity of 14.3 cubic metres without a toilet, but within this they include around two cubic metres for the capacity of the interior racks. A new option soon to be offered on all Tourliner length variants is the ZF EcoLife transmission. This can be specified with all engine options up to 460hp/2300Nm, which precludes only the 505hp unit. The company is in the latter stages of finalising the installation which I understand is already running in a Cityliner test coach. Also coming is the new PCV (Premium Comfort Valve) independent suspension system that will be used across the MAN/Neoplan coach range. It is a fully hydraulic, maintenance-free system with no electronics that is fitted on all axles and adjusts the damping curve for an improved ride. The change, which has no weight implications, will come in on Tourliner during the fourth quarter of this year. LED lights including main and dip beam are now standard across the Neoplan range and an option for the first time on the Tourliner is the MAN AttentionGuard system which monitors the driver’s reactions and warns of drowsiness if he becomes tired. The driver’s display screen is an inch larger and offers a much improved resolution so that it is easier to read. There are also changes to the Skyliner model which is celebrating 50 years since the first one took to the road on 27 April 1967 though unfortunately, there are categorically no plans to reintroduce it in the UK. New will be a Class 2 version with 91 high-back seats, integrated handrails rather than overhead luggage racks, a ticket machine mounting point, an integrated destination screen and the space normally used for the kitchen used to house electrical systems. An order for 100 has already been placed by Cotral SPA in Italy, 40 of which are scheduled for delivery this year. A fleet of ten examples of the three current variants was lined up outside the Palace of Culture in Warsaw. I travelled on a two-axle 12.1m variant with 44 seats on a return journey that gave me a total of close to six hours on the coach. 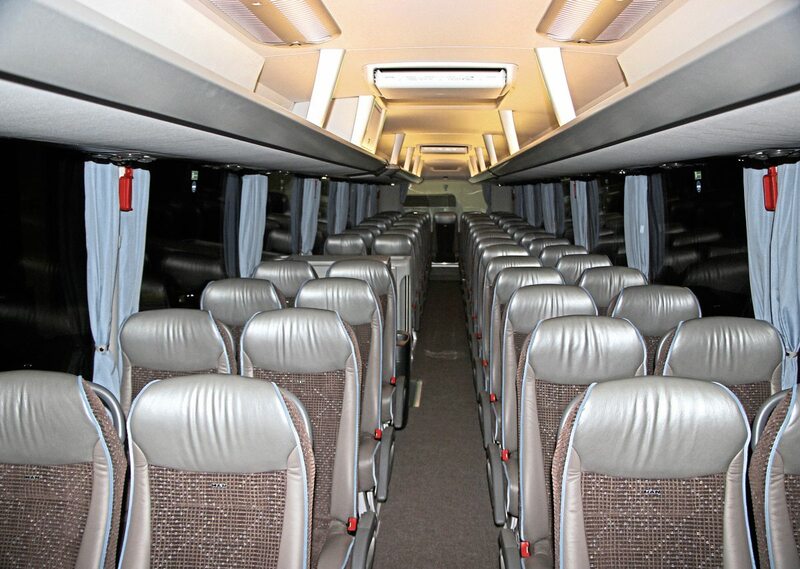 The previous Tourliner interior employed a different colour palette with a lot of pale blue in the ceiling area; this one had a light grey ceiling with air conditioning vents and rack edges in bronze and light coloured wood-effect flooring. 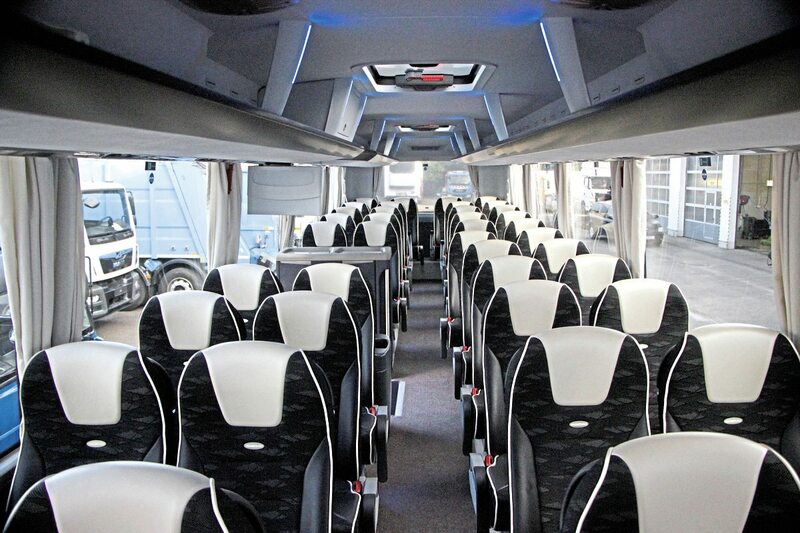 The seats were Brusa manufactured MAN Erino which featured predominately textile trim with perforated leather side pieces and headrest centre as well as piping. They were also fitted with seat-back tables with cup-holders and magazines nets and proved comfortable throughout. An observation I would make as a passenger is that the LGS lane departure warning system is disconcerting for passengers when it works audibly (as on the standard version) rather than silently as the optional driver’s in-seat warning does. It was equipped with the 12.419 litre MAN D2676LOH six-cylinder engine which develops 420hp/309kW at 1,800rpm and peak torque of 2,100Nm at between 930 and 1,350rpm, it had the MAN TipMatic transmission with intarder which is developed from ZF’s AS-Tronic fully automated manual. To increase the driveability by reducing vibrations and noise from the engine, it has a dual-mass flywheel as standard. Idle speed shifting (a crawling function) on gears one to six keeps the clutch closed after changes and ensures that the coach does not start to accelerate on its own when pressure on the brake is released until the accelerator is pressed. This reduces clutch wear. Speed shifting on the top three gears (10-12) maintains comfort but prevents momentum being lost when ascending. This last feature is particularly useful on higher-ratio axle options, though our coach had the standard 2.73:1 ratio. The low rev level at which the engine achieves maximum torque is accomplished by twin turbo charging with high- and low-speed turbines and, between the turbines, intercooling of the charged air. After the second turbine there is another stage of charge air cooling. I didn’t drive it but those who did reported it was good to drive, had unobstructed mirrors and pulled very well at low revs. It didn’t go into 12th (overdrive) gear until around 60mph and at 62mph/100kph was only doing 1,100rpm. When descending hills on cruise control, the coach goes into neutral and coasts when it can. Negative aspects were a tendency to be affected by side winds which as a passenger you were occasionally aware of, though for a 3.84m high two-axle this wasn’t surprising. Rather more annoying as a passenger was the regular ping as the automatic toll device acknowledged the passing toll transmitters. There was a small amount of wind noise, possibly from the mirrors and the central area of the steering wheel obscured the fuel gauge and water temperature gauge when driving. Somewhat surprisingly one of the footrests used by a colleague fell off when deployed. 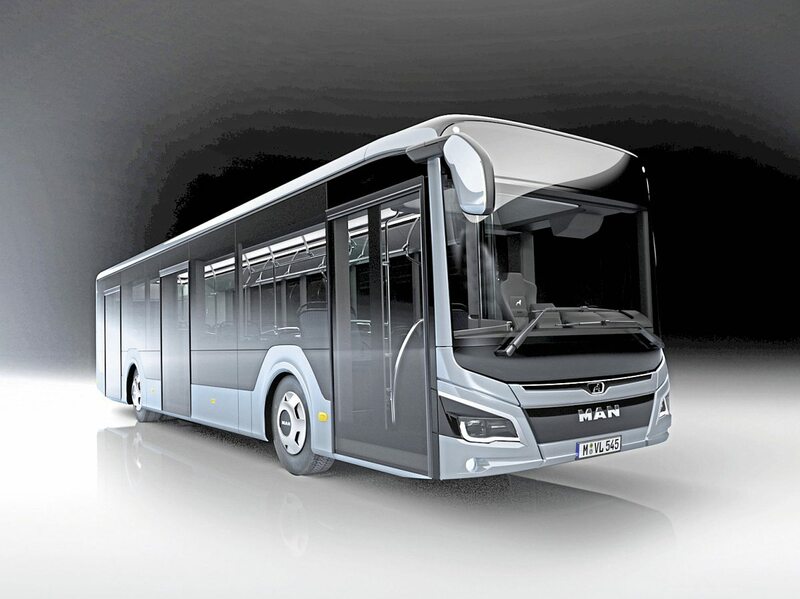 The existing MAN Lion’s City bus family has been in production for well over a decade, albeit updated with new technologies and successive generations of new engine technology as and when required. A new generation has been expected for some time and though no details about it had been revealed during the previous day’s press conference, as part of a visit to the Starachowice plant journalists were not only shown images of what the new family will look like but also given a virtual tour around the bus in the plant’s impressive ‘3D Cave’. In appearance, it follows the design language seen in the Lion’s Star coach and is consequently much more stylish and less heavy looking than the existing bus range, but with clear MAN heritage. A brief press release provided the information that the new model had been developed from scratch; it will be offered with LED lights including headlights and tail lights; road testing prototypes will begin in September; and the official launch will follow in spring 2018. A lower total cost of ownership is promised. There is a completely new driver’s cab said to be more ergonomic, comfortable and safe with a raised door and a higher mounted seat as well as repositioned switches and instruments to make it more user friendly. The new Lion’s City is to be built at the Starachowice plant in Poland where all MAN service buses are manufactured. This covers an area of 260,000 sqm, half of it covered in buildings, and has a long history stretching back to before World War Two when it was a munitions factory. Post-war, the Government selected it as the headquarters for the Star commercial vehicle business. It was acquired by MAN in 1999 and a lot of investment has taken place since. 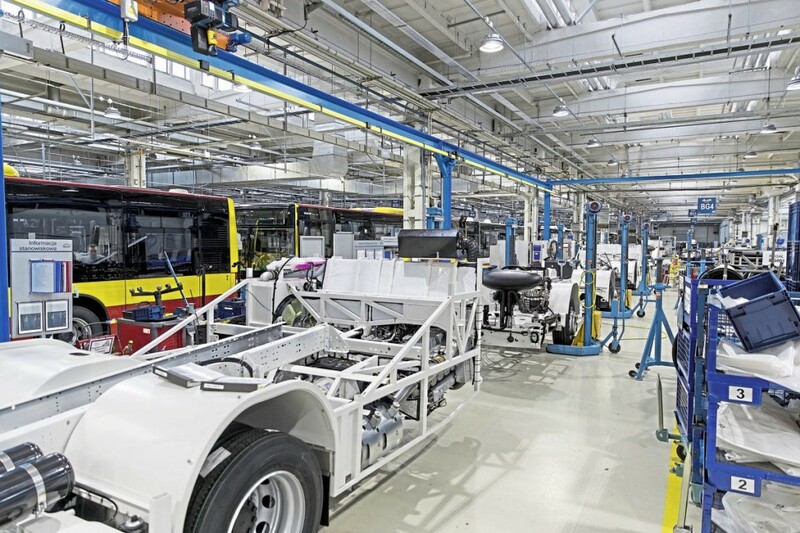 Today it builds 1,500 buses and chassis annually and can build the InterCity range if demand at the Ankara facility requires it. Until two years ago, the facility built the frame of the MAN city bus range which was then shipped the 420km/261miles to Poznan for completion. Under a €20m plan developed in 2014 and completed last October, the entire process has been transferred to Starachowice and the Poznan facility closed. 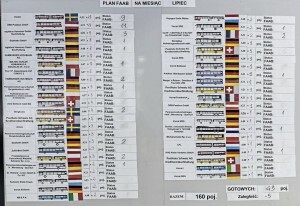 All employees were given the opportunity to transfer to either Starachowice or the VW van plant in Poznan or take redundancy packages, and though few relocated, around half stayed with the group. The move was accomplished without losing any days of production, with those who were going to be undertaking the transferred work spending time at Poznan learning the job before the transfer was achieved in eight stages. For the most skilled roles involving the electrical installations, the training period ran to 18 months. There are now around 2,600 employees at the plant, 1,600 of them on production and 1,000 on assembly and of these, 780 jobs are newly created. The total includes 150 research and development engineers. Run on lean manufacturing principles, the plant is becoming increasingly vertically integrated though it does still rely on some parts brought in, mostly from Germany. MAN plants. Some 90% of metal parts required are made on site and parts are also manufactured for use at the Ankara and Salzgitter facilities. It is becoming increasingly automated with heavy investment in new laser cutting equipment, bending machines and tube cutters, There are plans to replace the manual painting facility with an automated one next year. Adopting the maxim, ‘green production with green products’ the plant has reduced emissions by 30% compared with 2008 levels and from 2019 will be producing MAN’s electric buses. Ensuring the integrity of each bus, the various chassis, side, roof and front sections are united in one of two massive jigs. 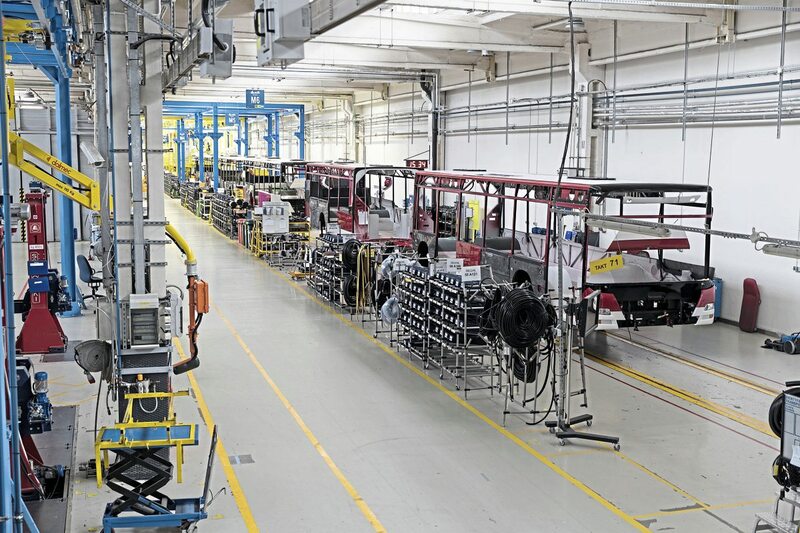 At the heart of the longevity that purchasers expect from their buses is the biggest cathodic dip facility in Poland, which electrostatically coats the frame with a protective layer in a 70-minute process. With its ten chemical tanks, this facility can cope with two buses simultaneously. To maintain efficiency, racks of parts are dipped in the vacant space ahead of shorter vehicles. Once the structure is built and protected, it is on to the assembly section for completion. This area has been increased from two lines to seven and the average age of the workforce is lower than in the production section, largely because so many were newly recruited as a consequence of the relocation of the work. In the assembly area, it is astonishing to see the variety of colours on vehicles for all over the world. It is not only the production facilities that have seen extensive equipment. 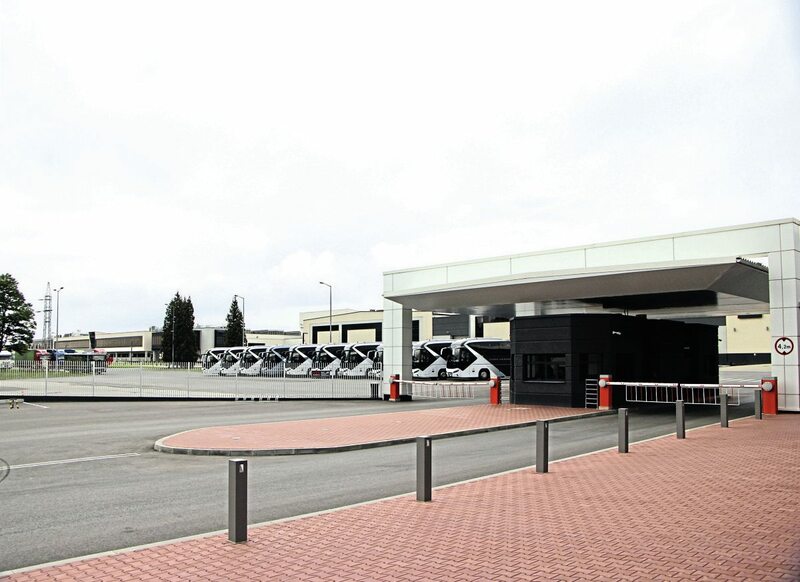 As well as the 3D Cave with its projectors, stereoscopic computers and infra-red cameras that enable the Automatic Vehicle Environment to be generated, there is also a new fuelling centre, new office provision and a new customer-care centre. 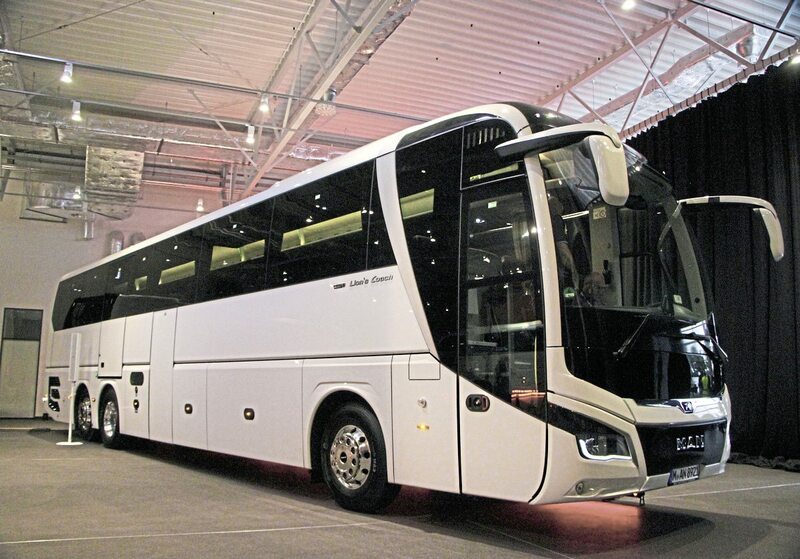 At Kortrijk’s last Busworld from 20-25 October, MAN and Neoplan will be located in Hall 2, displaying five vehicles. From Neoplan will be the Tourliner and Skyliner while the MAN brand will be represented by the Lion’s Coach, Lion’s Intercity and Lion’s City Hybrid. Supporting them will be displays and representatives from MAN Transport Solutions, MAN Bus Modification Centre, MAN Profi Drive and after sales services. 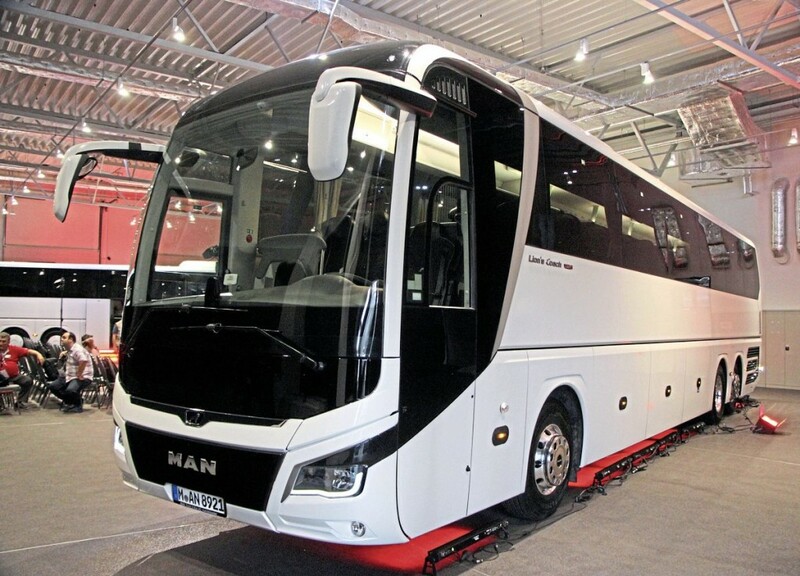 MAN has invested heavily in its bus and coach offerings in recent years, showing the Volkswagen Group’s clear intention to maintain and develop the brands as it has done with its car marques. There is little sign yet of closer working with Scania, though this will no doubt come in time. Both the Lion’s Coach and the Neoplan Tourliner are competent renewals of established models that will be further enhanced in the relatively short term, but it is the, arguably overdue, launch of a new generation of buses that will be crucial to the business maintaining the growth it looks for.